Base Force: now made with 37.5™ Technology, which is scientifically proven to give you more stamina. Base Force was designed to keep you warm enough to handle a 12-hour work day. Welcome to the warm world of Carhartt Base Force® Thermals. Available in 4 different weights: Lightweight, Midweight, Heavyweight Synthetic, and Heavyweight Cotton. Base Force was built for those who get up and go when the frozen wind blows. They’re sweat-wicking and stain-busting to help you own the cold and stay warm and dry in tough conditions. Ordinarily, I'm a huge fan of Carhartt for durability and value. I was hesitant to pay $15-$17 per pair for Carhartt underwear, but ultimately caved to my Carhartt addiction and figured it would last longer than other brands. In late December, I ordered a pair of Carhartt boxers, but wasn't impressed with the fit. Very hesitantly, I ordered a pair of boxer-briefs in late January and was so pleased with initial quality I decided to order two more pairs in early February. By the end of February, I ordered four additional pairs for a total of seven pairs of boxer-briefs and one pair of unusable boxers. All was well until today. One of the crotch seams popped on the first pair of boxer-briefs. I know they're the first pair because the Force Extremes logo on the leg has deteriorated. At this time, I can't give the boxer-briefs more than one star. If the other six pairs turn out to be durable, I'll call it a fluke. Until then, the one-star rating remains. I have roughly $130 in eight pairs of Carhartt underwear and can only wear 6 pairs of them within the first three months of ownership. Unacceptable. We appreciate your loyalty and are sorry to hear this. Your input will be shared with Quality Control. Please contact us at 1 800 833 3118 if you need assistance. I am so disappointed in these underwear it’s hard to explain. The material is soft I’ll give it that, really the only thing I can say good about them. The fit is awful compared to another brand's and other performance underwear. It’s as if they were put together wrong. They don’t move with you like others do. These have been washed 6 -8 times and they already look like they are years old. The elastic is stretched around the legs and seems it will around the waist soon. Just now before I wrote this review I noted a 6” long piece of string hanging out where the seem is coming undone in the crotch area. I realize most of carharts stuff is imported but I have had good luck with some of their other stuff, underwear not so much. Never again will I buy these and I don’t recommend it to anyone else. I can’t speak to how they will do in the Texas summer cause don’t think they will last that long. We appreciate your feedback and have shared it with our product design team. Please contact us at 1-800-833-3118 if we can assist you further. Breathable, comfortable, and a great fit! I'm 6' 4" with a 39" waist and the Large are perfect for me. I tried XLg and they're just too baggy. These boxer briefs are basically like wearing nothing except all your stuff stays in place. Perfect! Finally a boxer brief that fits great and is breathable. Keeps me comfortable all day long. These are very comfortable and provide good support. They are good for hot days. They have a good stretch to them. They seem durable. These are probably the most comfortable underwear I've worn. I own several pairs and recommend them. Got them to help with summer sweat thigh rub. Will buy more. My confidence in Carhartt products continues, have been very happy with every purchase of their products. I really like this underwear it is really comfortable. Theses are the best feeling underwear I have ever had. I would never wear anything else except for one issue. The only issue, but by no means small one, is that the fly is cut too high. I am 6-3 205 and literally have to pull my shorts down a bit to comfortably use the fly. Guys you know the hassle without going into detail. We appreciate your input and have shared it with Product Design. Please contact Customer Service at 1 800 833 3118 if we can further assist in any way. Great product .... Hands Down ....!!!!! I am 6 foot and 200lbs, muscular dad body. I work for a water and sewer utility company. I had high hopes for these.Unfortunately these boxer briefs were very disappointing. I found the large seam running up the middle of the rear of the briefs very uncomfortable. The elastic around the legs failed half way through the first work day causing the legs to hang and flop around like boxers rather than boxer briefs. My biggest complaint though is the lack of a crotch gusset. No support just pinching. Working in under ground utilities means lots of movement and these underwear did not make the cut for comfort or function. I did like that the fly seemed larger than competitors and that the waist sat higher than competitors boxer briefs. My son wears these for soccer practice. They stay snug all day and keep him nice and dry. Very comfortable wearing all day at work but the hole in the fly should be lower. We have forwarded this comment to our Product Design Department. Legs too tight. Which causes them to pull waist down. The only product I have found that meets ALL my criteria. I am elated to have discovered them, and feel that I have found a product for life. Don't ever change the waistband in particular, it is wonderful. I prefer a boxer brief that is more mid thigh and this is not but it does move up and down nicely so is much better than i expected. Good product as with all the Carhartt stuff i buy. But again I am just too tall for even tall sizes many times. Had my doubts since they are not cotton, but I have found them to be better. I'm a pilot so I sit for long periods not being able to move around much. Tried a couple of pair to start and found them extremely comfortable. I now own 10 pair and highly recommend them to anyone. These new boxer-briefs are a great improvement over the previous ones. The way-too large sizing has been corrected. I bought these in XL and they are much truer in size, albeit still running large a tad. In the previous versions, a Large fit like a 3XL. Thanks for the improvements, and it would be nice to see some different colors as well! After wearing my new underwear a few times I have fallen in love with them! At first look I was kind of undecided about them because they looked a little loose fitting but after wearing them I'm sold! Super comfortable and I believe they will also be very durable. 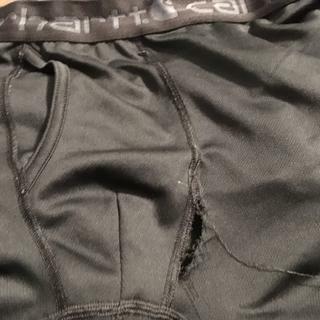 BOUGHT A FEW PAIR OF BOXER BRIEFS 6 TO 8 WEEKS AGO THE SEAM IN THE CROTCH HAS GIVING AWAY LEAVING A HOLE 2 PAIR OUT OF 5 NOT VERY GOOD AVERAGE SENCE THEY MIGHT HAVE BEEN WORN JUST A HANDFUL OF TIMES. Carhartt has reached out to the customer and shared the review with our Quality Control Department. Will Carhartt be offering a horizontal or 'H' (sometimes called "grab 'n' go) fly? These are the best types of fly openings for a man. Is this a single pair of briefs? BEST ANSWER: Yes; these are sold individually. Can you make the boxer briefs in 5X soze. I bought 6 pairs in 4X size and they fit too tight.????? BEST ANSWER: We'll be glad to share your input with Product Design. Please feel free to call Customer Service at 1 800 833 3118 with any questions. My thighs rub together and cause material to wear out. Do these tear easily? BEST ANSWER: No I've had mine for two years and still no tearing they are the best thing I ever bought! No, my thighs rub together, too and they aren't loose like regular underwear. No. I’ve had mine for a while now and they seem to be very durable. No these are extremely durable. I think you'd be happy with them. what are the cleaning instructions? BEST ANSWER: Machine wash cold. Use non-chlorine bleach when needed. Tumble dry low, Do not use fabric softeners. Cool iron if needed. Do not dry clean. Are you going to make briefs? BEST ANSWER: We do not currently plan on offering briefs, however we are happy to forward your suggestion with our Product Design Team. Enter an answer to this question.It would be great if Carhartt made briefs - the boxer briefs at enice but there's a lot of guys out there who'd enjoy nice quality Carhartt briefs for work! The price is for single? BEST ANSWER: Yes, these boxer briefs are sold individually, not in a multi-pack. Are these 6" or 9" inseam? BEST ANSWER: The inseam for all sizes is 6 inches from the center gusset. These are closer to 6". How do you know your size. I normally wear I size 34,36? Carhartt has a size table that is linked to most products. It can also be found on home website. The sizes run fairly true I have found. My boyfriend wears a 31 or 32 waist and he orders a small, which is a size down than his typical boxer brief size. Hope this helps! There is a size chart on the page for your convenience. What country is this boxer imported from? BEST ANSWER: They are a mixed stock from Haiti and Dominican Republic. BEST ANSWER: This style is made of 4-ounce, polyester. BEST ANSWER: They are sold as individual pairs. what is the weight of these boxers? BEST ANSWER: The gross weight varies depending on the size. The small is .2 lbs; this ranges all the way up to a 4XL, which has a gross weight of .32 lbs.